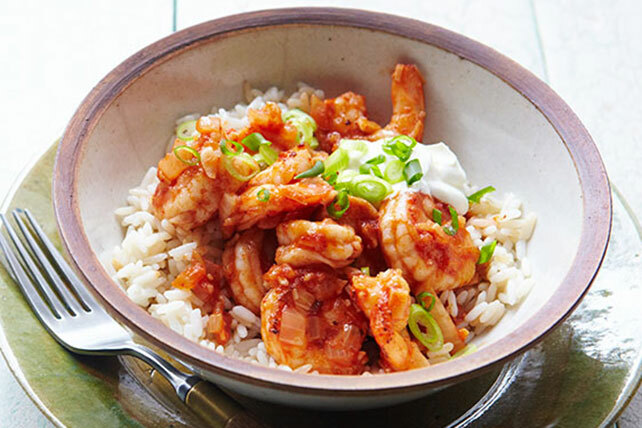 This Healthy Living Saucy Shrimp a la Diabla is as devilish as you'd think. Get out the arbol chilies and thrill your heat-loving friends. Heat 1 Tbsp. oil in large skillet on medium heat. Add garlic and onions; cook 5 min. or until tender. Remove from skillet. Heat remaining oil in skillet on medium-high heat. Add shrimp, in 2 batches; cook and stir 3 min. or until pink. Remove from skillet; cover to keep warm. Return garlic, onions and shrimp to skillet; stir in sauce mixture. Bring to boil; simmer on low heat 3 min. or until heated through. Spoon over rice; serve topped with onions and sour cream. Add more arbol chiles if you want to make the sauce spicier. Omit rice and serve as an appetizer. Make 16 appetizer servings.